Directions: In a large (12-13"), nonstick sauté pan, sauté onions, shallots, garlic, & bay leaf in olive oil on low heat until translucent but not browned, about 3 minutes. Stir frequently. Season with a small pinch of salt to help evaporate moisture faster, sprinkling from high above to ensure a more even distribution. (Don't add all of it into the pan now; you'll be using the remainder of the salt later on in the cooking process.) Turn up heat to medium, & mix in dry, uncooked rice & orzo, stirring continually for about 1-2 minutes. Watch pan carefully so rice & orzo mixture doesn't brown or burn. (This step is particularly important, as it cooks off the starchy coating of the rice & orzo & prevents the grains from getting sticky and mushy when the liquid ingredients are added. The rice & orzo mixture should be slightly crispy, but not browned.) Deglaze with sherry, stirring constantly, adding a 1/4 c. at a time, until liquid is absorbed. While sherry is reducing, add dried mushrooms & all fresh herbs minus the fresh basil, (which will be used later for garnish). After sherry has mostly evaporated, use a liquid measuring cup to incorporate water or stock, adding only one cup at a time, stirring constantly. Allow each cup to be absorbed before adding the next. Each addition should be only just enough to cover the rice & orzo mixture. Next add butter (if using), & season with turmeric, black pepper, & remaining salt. Reduce heat to low again & simmer, uncovered, until rice & orzo are al dente, about 20-25 minutes. Test to see if it's ready by pinching a rice grain; if only 2 or less beads remain, the rice is done. Rice should be creamy but still firm. (Most of the water should be absorbed by this point.) When ready, remove from heat & let rest for 5-10 minutes. Then stir in lemon juice, mixing thoroughly to evenly distribute ingredients. 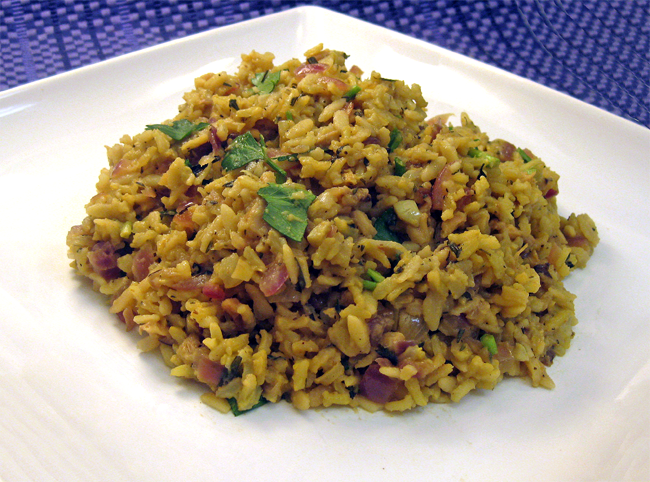 Fluff pilaf lightly with fork before serving & garnish each portion with fresh basil. Serve immediately.